Singing “Supercalifragilistic” at the office today it got me to thinking about the secondary status that many people give to Disney’s 1971 classic Bedknobs and Broomsticks. While I imagine that Mary Poppins (1964) is more widely cherished (it does have its own Broadway musical after all) I find that as an adult I am much more drawn to Angela Lansbury’s witch Eglentine Price. 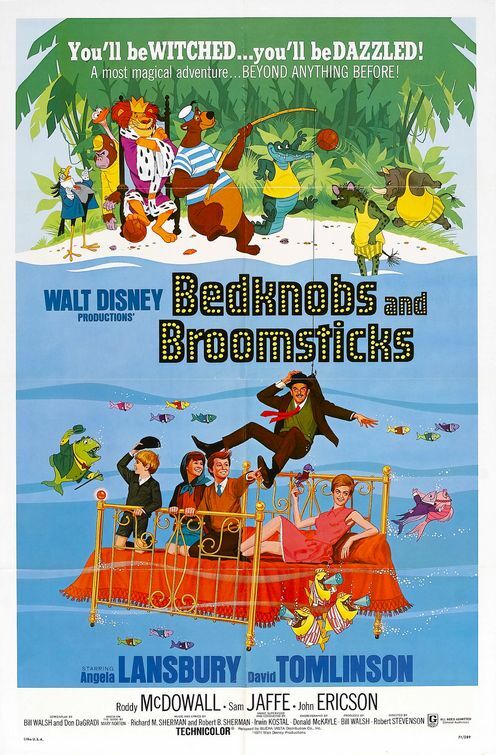 Bedknobs and Broomsticks always felt much more fulfilling than Mary Poppins. Don’t get me wrong… I love Mary Poppins… but Disney’s other witch-makes-childrens’-lives-better movie had a stronger pull for me then and now. I think it must be the grittier subject matter and the darker air that Bedknobs offered. Besides that… looking below, we can compare the stories of Ms. Poppins and Ms. Price and deduce who would win in a cage match of magical British caregivers. I’m just sayin’… maybe Eglentine deserves some extra credit for what she and her friends could do. While you think on that, enjoy this magical moment from the film. >I want a Bednobs and Broomsticks Broadway Musical now!! !